Goldfish booming in Hamilton Bay. 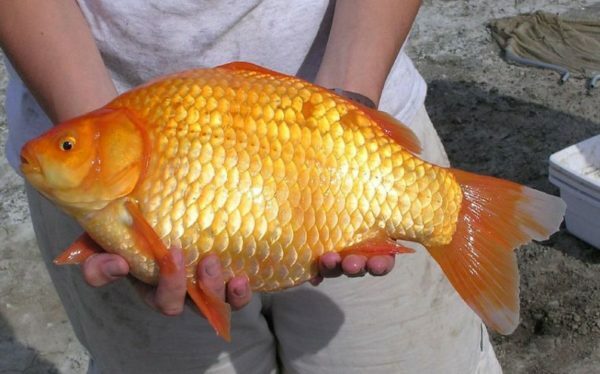 Beneath the murky surface of Hamilton Harbour thousands of giant goldfish are teeming, tearing up vegetation and threatening native species. But now, thanks to a first of its kind study, researchers are have a new weapon in the battle to keep the harbour from becoming a giant goldfish bowl. It’s called acoustic telemetry. About a dozen of the fish were sedated and fitted with sound-emitting tags about the size of an AA battery, allowing scientists with Fisheries and Oceans Canada to track where they move. Millions of eggs and an explosion of goldfish. Bad news for Canadian fish: Fewer people are fishing them. 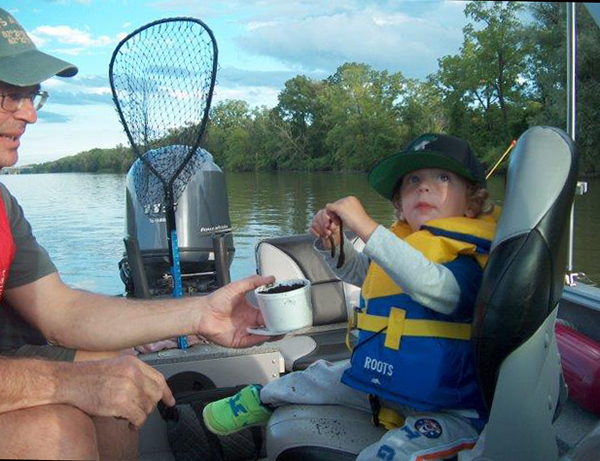 A prominent Ottawa biologist wants more of us to pick up a fishing rod and reconnect with nature as a way of protecting our lakes and rivers and the wildlife in them. Steven Cooke of Carleton University says the latest survey from Fisheries and Oceans Canada shows a problem: Fishing is at risk of becoming an old man’s pastime. Released two weeks ago, the Survey of Recreational Fishing in Canada, 2015 shows that the sport fishing population “continues to age. So we are failing to recruit new anglers,” he said. Fewer hooks in the water may sound like good news for fish, but Cooke says it is not. Noel Gyger reports. Mainly sunny with highs to +13 degrees C. Skeena River is low and in good shape BUT forzen over in some spots but lots of open water now. Steelhead are being caught where you can find open accessible water 🙂 Please be careful running your jet boat as water is very shallow and be careful waking on the ice. Coho fishing closed October 31st. 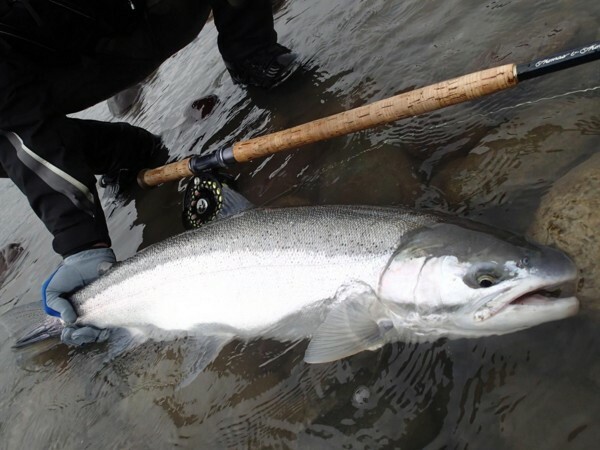 Tyee Test Fishery showed a record run of Steelhead last season. Kalum River is in fair shape and fishing well for Steelhead. Both fly and spin fishing are working well. Kitimat River is closed to Salmon fishing. Lots of open water now and the Steelhead will be coming soon. Zymoetz (Copper) River is in fair shape with some open water and Steelhead are being caught. Note this regulation: No Fishing upstream of the sign at the transmission line crossing (downstream of Zymoetz Canyon) Jan 1 – June 15. Steelhead fishing below this closure is still permitted. Ocean fishing for Salmon, Halibut, Prawn, Dungness and Alaska King Crab is good out of Kitimat. 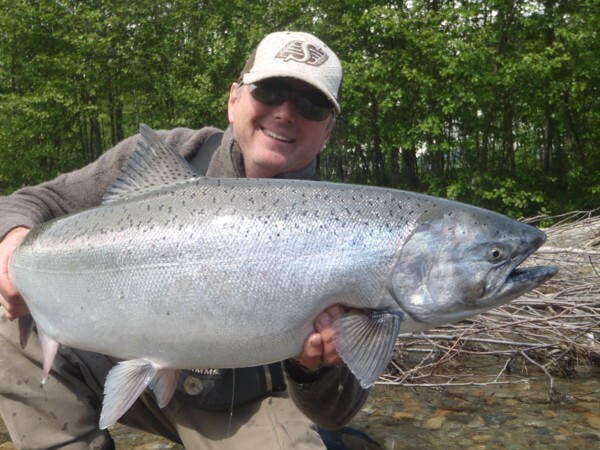 If you would like to book a river fishing guide or ocean charter for 2018-19 you can contact Noel at www.noelgyger.ca . Noel Gyger reports. Saturday light rain with highs to +6 degrees C. Sunday a mix of sun and clouds with highs to +10 degrees Celsius. Skeena River is low and in good shape BUT frozen over in some spots but lots of open water now. Steelhead are being caught where you can find open accessible water 🙂 Please be careful running your jet boat as water is very shallow and be careful waking on the ice. Coho fishing closed October 31st. Tyee Test Fishery showed a record run of Steelhead last season. Kalum River is in fair shape and fishing well for Steelhead. Both fly and spin fishing are working well. Kitimat River is closed to Salmon fishing. Lots of open water now and the Steelhead will be coming soon. Zymoetz (Copper) River is in fair shape with some open water and Steelhead are being caught. Note this regulation: No Fishing upstream of the sign at the transmission line crossing (downstream of Zymoetz Canyon) Jan 1 – June 15. Steelhead fishing below this closure is still permitted. Ocean fishing for Salmon, Halibut, Prawn, Dungness and Alaska King Crab is good out of Kitimat. BC saltwater & freshwater fishing update. Feature images shows Tracey Hittel with a trophy BC tributary Chinook salmon. Noel Gyger reports. Mix of sun and clouds with highs to +3 degrees Celsius by Sunday. Skeena River is low and in good shape BUT mostly frozen over in some spots. Steelhead are being caught where you can find open accessible water 🙂 Please be careful running your jet boat as water is very shallow and be careful waking on the ice. Coho fishing closed October 31st. Tyee Test Fishery showed a record run of Steelhead this season. Coho run was way down this year. Kalum River is in fair shape and fishing well for Steelhead. Both fly and spin fishing are working well. Kitimat River is closed to Salmon fishing and is just about all frozen over. Zymoetz (Copper) River is in good shape (mostly frozen over) and Steelhead are being caught in open water. Note this regulation: No Fishing upstream of the sign at the transmission line crossing (downstream of Zymoetz Canyon) Jan 1 – June 15. Steelhead fishing below this closure is still permitted. Ocean fishing for Salmon, Halibut, Prawn, Dungness and Alaska King Crab is good out of Kitimat. Brian Hartman NY state record Walleye. Brian Hartman started off the 2018 walleye fishing in a memorable way. He caught a fish on the St. Lawrence River that’s since been declared a state record.Hartman, of Alexandria Bay, NY, shared his story with NYup.com . Hartman and his fishing buddy, Mike Savoia, of Connecticut, headed off from a rented house on the river in Morristown at 4:30 a.m. opening day. They started off drifting and jigging. Hartman was using a 4-inch, pearl-colored swimbait. They picked up a few small walleyes early on. Then, at 6 a.m., Hartman hooked the big one. The bite was slight at first, he said, but there was no doubt he had a lunker on after he set the hook. His initial thought was to let the fish go as he said he has done countless times before with big ones he’s caught. His buddy even urged him to do it. But this time, he felt things were different. “This one goes on the wall,” he said. He had the 32-inch fish weighed three times before a certified scale at the Thousand Island Bait Shop in Alexandria Bay, NY registered the fish’s official weight at 18-pounds, two ounces. The weight eclipsed the previous state record set in 2009 by more than 1.5 pounds. The old record was actually set during the ice fishing season and caught with a tip up. Thomas Reed of Kill Buck, N.Y. pulled a 16-pound 9-ounce walleye through the ice on Mystic Lake in Cattaraugus County, NY in late January. Late winter Channel Catfish action. 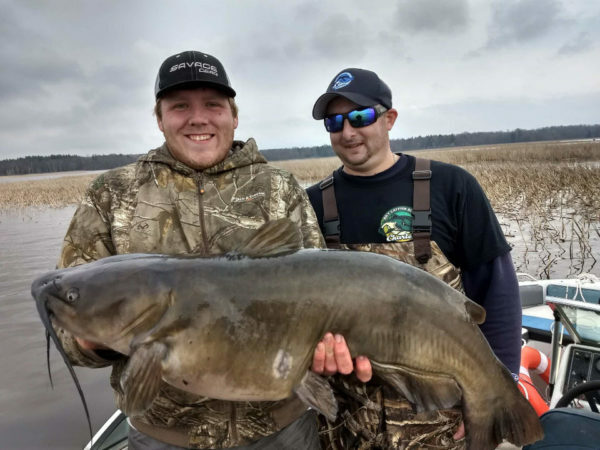 Pennsylvania angler Josh Taylor caughtn this monster Channel Catfish in the Chaumont Bay, NY area off Lake Ontario while fishing with Capt. Eric Scordo of NY Catfish Hunter Charters. Channel Catfish start moving into warmer bays and rivers as early in March in many Great Lakes bays and tributaries. Derek Stoner 14.85 pound lake trout. Most Lake Ontario anglers know how good the Lake Trout fishing has been over the last couple decades. Much of this has been due to good stocking programs but also to lamprey control. 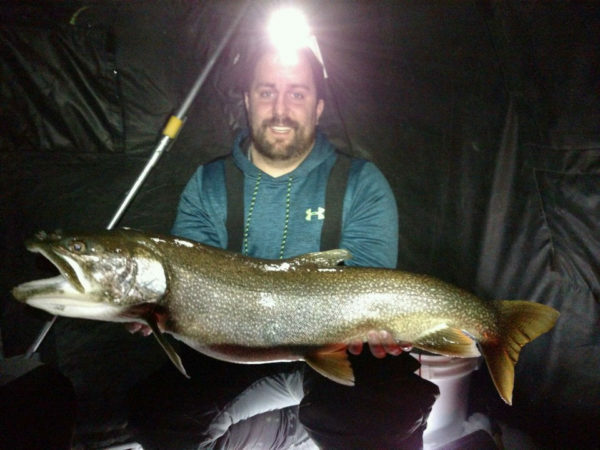 While we enjoy great lake trout fishing in the eastern and western basin, NY state also gets it’s share of trophy Lake Ontario lakers. Derek Stoner caught this 14.85 pound lake trout fishing on Chaumont Bay, NY on Lake Ontario using a Rapala Jiggin Rap. Jarame McClelland 44 inch pike. 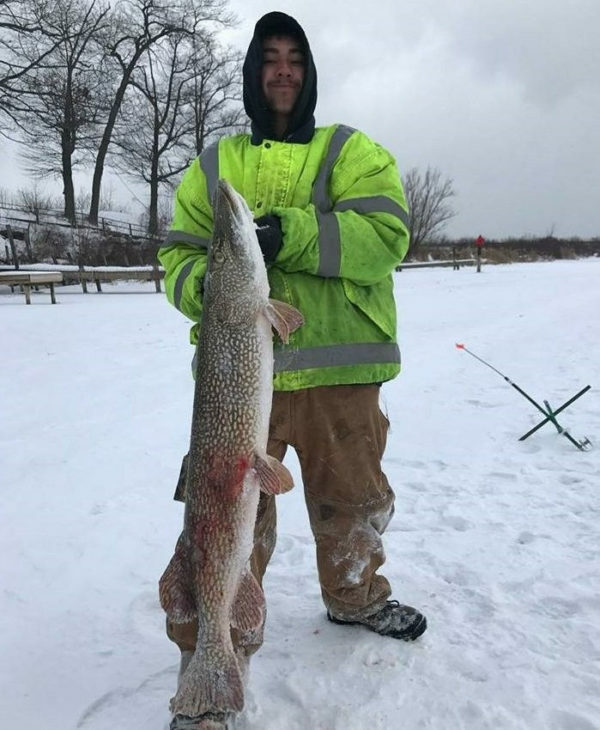 Jarame McClelland, 16, of Newfane, N.Y. caught this impressive 44-inch northern pike in Wilson Harbor on Lake Ontario on a large chub. Jarame is a student at Newfane High School. He is also president of the Newfane School District Conservation Club, a club that he helped create. 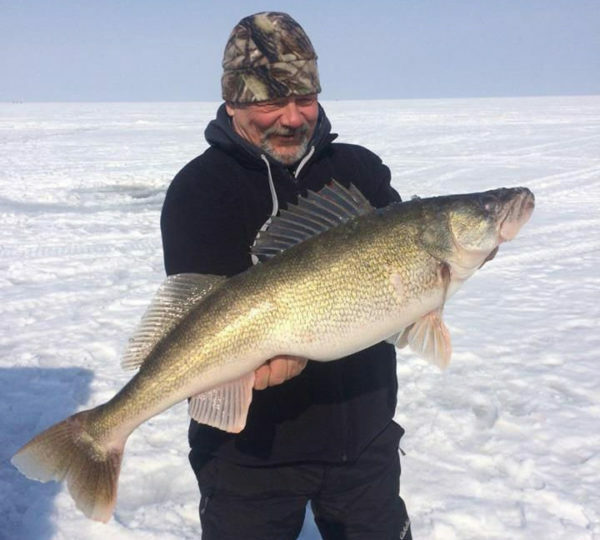 Check out this 14.56-pound walleye caught through the ice on Lake Erie near Hamburg, NY by Bob Rustowicz of Cheektowaga, NY in February. 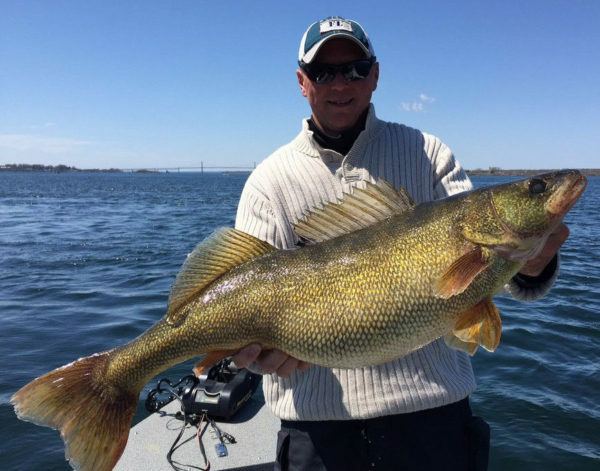 It was a banner year for walleye fishing on Lake Erie last year.